Whirlpool's KitchenAid brand introduced a smart display at CES that responds to voice commands on Google Assistant, the search giant's virtual assistant. The KitchenAid Smart Display, which is meant to be hands-free hub for smart cooks, has a 10-inch screen and is made to be washable and resistant to faucet water, according to an announcement. The smart display can provide step-by-step video recipes from Yummly, shopping lists, integration with smart-home devices, video calls and streaming video, music and podcasts. KitchenAid will start selling the gadget during the second half of 2019 for a price ranging from $200 to $300, CNet reported. Google Assistant will be on 1 billion devices by the end of the month, up from 500 million in May, according to estimates from the search giant. The voice-enabled assistant works with more than 10,000 smart-home devices from 1,600 brands. In comparison, Amazon says it has sold 100 million Alexa-powered devices, according to The Verge. KitchenAid's entry into the market for smart displays is another demonstration of how consumer appliance makers are preparing for the future of the connected home. 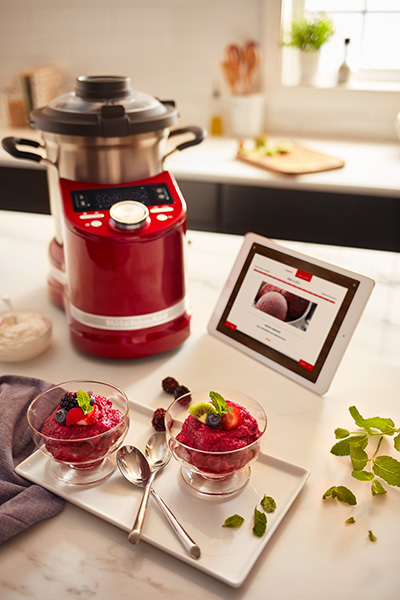 The KitchenAid Smart Display is a sleek-looking touchscreen device that's made to withstand inevitable splatters and splashes that come with preparing meals and cleaning up. The smart display runs on Android Things, Google's operating system for smart-home appliances that also powers the Lenovo Smart Display, the JBL Link View and the LG WK9. KitchenAid's biggest challenge will be distinguishing its device from a crowded field of gadgets using the same operating system and virtual assistant, as CNet notes. KitchenAid doesn't even have exclusive content from Yummly even though the companies share appliance maker Whirlpool as an owner. Yummly's app, which is available for iOS, Android and web browsers, this year will introduce voice commands for its recipe and cooking content. KitchenAid's integration with Google Assistant is another indication of how the search giant's virtual assistant is gaining widespread acceptance among appliance makers. Google and Amazon are vying for market share in the smart-home market, which relies smartphones and listening devices like smart speakers to react to voice commands. Amazon has said that 100 million devices work with its Alexa digital assistant, a number that likely doesn't include smartphones running the Alexa app. More than 150 products have Alexa built in, while more than 28,000 smart-home devices from more than 4,500 different manufacturers can connect to the virtual assistant, The Verge reported. Software developers have created more than Alexa 70,000 skills, or apps that work on the voice platform. The Verge Amazon Says 100 Million Alexa Devices Have Been Sold — What's Next?